The Hidden Valley Handcrafts are a pro-nature line of products initiated by a family living in Broome. Today the business is one of its kind and the products showcase just that. The place is known for retailing all natural soaps, candles, cosmetics, hair-care, gift packages and more. If you are one of those travellers who have a long list of friends and want to a one-stop for all gift shopping or simple someone who love the effect or thought behind natural products- the Hidden Valley Handicrafts is truly a hidden gem! The place is known for selling all natural products- the perfect gift for friends and family back home. Rent a Car or Bike to reach the place. How popular is Hidden Valley Handcrafts? 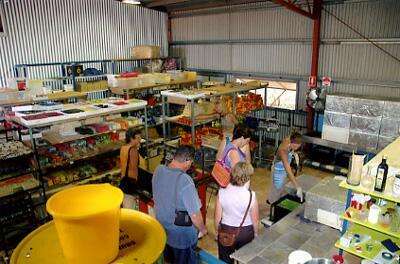 People normally club together Pearl Luggers and Cable Beach while planning their visit to Hidden Valley Handcrafts. Just walking into Hidden Valley makes me feel good - such delicious scents!